With the continued growth of the American economy and the high numbers recorded on the U.S. stock market, it is not unreasonable to find out that there are more affluent and wealthy Americans today than ever before. 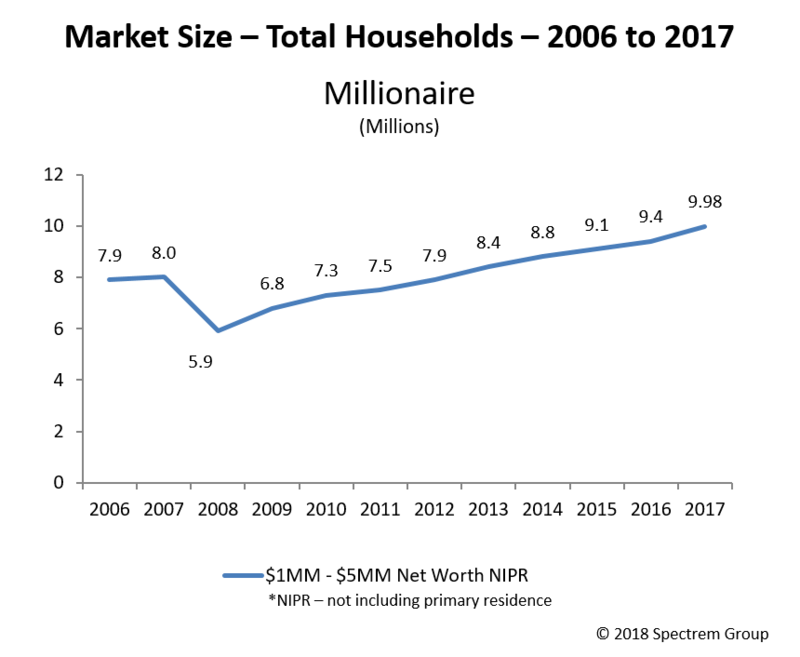 According to Spectrem Group’s Market Insights Report 2018, the number of Americans with a net worth between $1 million and $5 million grew by 600,000 last year to approach 10 million Millionaires. At the same time, the number of Americans with a net worth over $25 million grew by more than 10 percent in one year to 172,000 households. “These totals indicate an increasing population of affluent Americans and reflect the effects of the growth of the stock market and economy in the United States in 2017,’’ said Spectrem president George H Walper Jr. The sheer numbers of affluent and wealthy Americans are high, but they are especially notable as they compare to last year’s totals and the totals recorded in 2008 when the United States experienced The Great Recession and household wealth was reduced by 25 percent or more across the board. There were 31 million Americans with Mass Affluent status in 2017. The Mass Affluent Americans are those with a net worth between $100,000 and $1 million not including the value of their primary residence. That number increased by half a million in one year and has grown by almost seven million since 2008 when the Great Recession struck. In 2008, there were 5.9 million Millionaires, those with a net worth between $1 million and $5 million. Now there are 9.98 million Millionaires, an increase of more than two-thirds in 10 years. Among Ultra High Net Worth Americans with a net worth between $5 million and $25 million, the number reached 1,348,000 households, an increase of 84,000 from 2016. And the 172,000 households with a net worth over $25 million is not only a 10 percent increase from one year ago, it is more than double the 84,000 recorded in 2008. The number has increased by 50,000 since 2012, just five years ago. Spectrem has compiled its Market Insights Report annually since 2006, and the charts accurately reflect the dips and climbs of American affluency over that period of time. In 2017, all the wealth segments reported their highest numbers in the history of the Market Insights Report, with 8 million Millionaires, 1.04 million Ultra High Net Worth Americans and 125,000 $25 million plus citizens. After the precipitous drop caused by the Great Recession, it took just five years for those totals to return to pre-recession levels and they have continued to rise annually in the five years since. Simply put, there are more wealthy people in America today than ever before, and that means there are more potential affluent investors who need financial advice. An advisor who wants to increase their client list should broaden their search functions to include new markets for affluent Americans, especially Millennials, many of whom are in their mid-20s and just now reaching a financial status that calls for investing available assets.